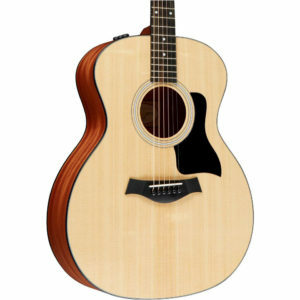 The Taylor 110 is a superb option for the budget-minded guitarist or an “extra” guitar for the seasoned player, the 110ce has an extremely rich and versatile voice. 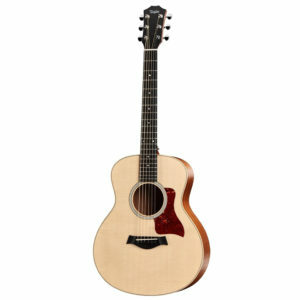 A cutaway adds upper range to Taylor’s most affordable full-size dreadnought, while the ES-T pickup primes you for plugging in. The Taylor 110e acoustic-electric guitar is an excellent choice for a beginning guitarist or for a seasoned player’s extra guitar. Get your hands on the 110e, and you’ll be blown away by its rich tone and outstanding projection right from the first strum. You’ll find the 110e’s mahogany neck extremely comfortable and playable, while its Sitka spruce/walnut tonewood combination provides you with the perfect balance of warmth and sparkle. On top of that, the onboard ES2 electronics ensure that you’ll sound your best — plugged or unplugged. 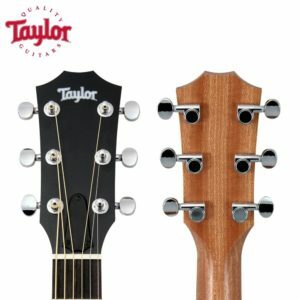 Taylor applied their decades of guitar-building expertise to designing the affordable Academy A10e that sidesteps these issues to deliver a guitar that plays comfortably and effortlessly, removing the barriers to your development as a player. 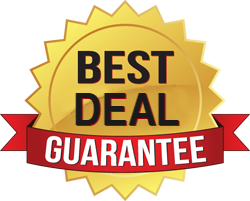 And it does it at a price that will astound. 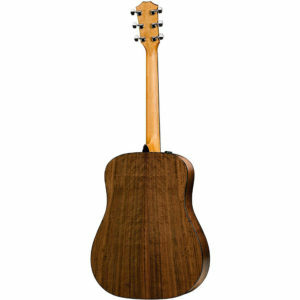 And even seasoned players will love the high-quality tonewoods, the tone-enhancing varnish finish, and the unique armrest that reduces fatigue. 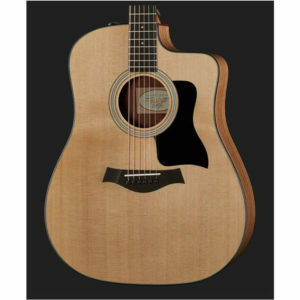 The Baby Taylor’s scaled-up sibling, the Big Baby (15/16th-size), makes a sleek yet full-sounding travel companion with its svelte four-inch body depth, which is about a half-inch shallower than the depth of a standard Dreadnought. 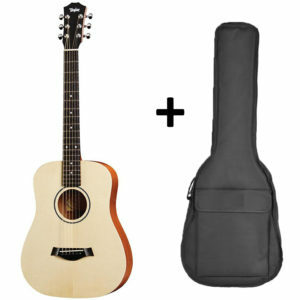 Slightly bigger than a Baby Taylor and just shy of a full-size guitar, the Big Baby Taylor is ideal for easy-playing, great-sounding guitar fun. The overall size keeps you in the “”portable”” category, yet with an extra dose of volume and fullness. Like the Baby, the Big Baby has an arched back that provides strength and contributes to its big tonal output. 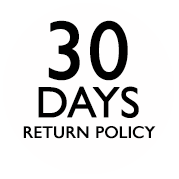 All Big Baby Taylor models ship with a durable travel-worthy gig bag made by Taylor for optimal fit and protection. 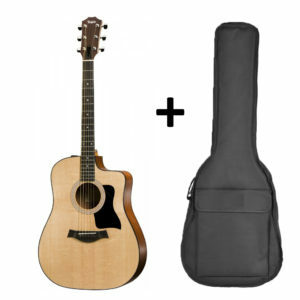 The three-fourths-size Baby Taylor, with either solid spruce or solid mahogany top, makes a great-sounding traveling companion. 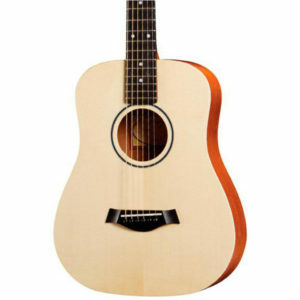 The larger Big Baby (15/16 of full-size) has a spruce top and plays like a grownup. 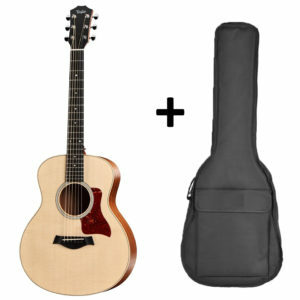 Both feature layered backs and sides and come with a gig bag to help you get around. Taylor’s Baby Taylor-e acoustic-electric guitar is the perfect travel companion and writing guitar thanks to it’s compact size. 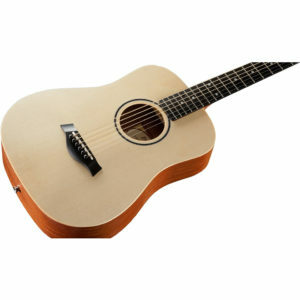 A Sitka spruce top and layered sapele back and sides give this guitar a tone that transcends its size. The 3/4-size design is extremely comfortable and fun to play. And when you need to plug in, the Baby-e has Taylor’s new Expression System Baby pickup built in. 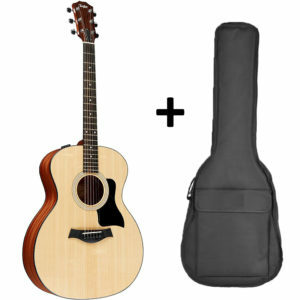 It uses the under-saddle pickup of the ES2 system coupled with a preamp that sports a chromatic tuner. 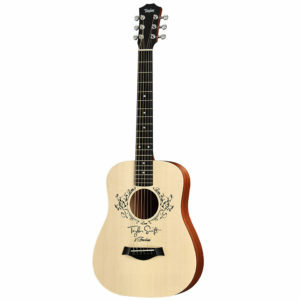 Whether you’re looking for a guitar to craft songs on or a great travel guitar, the Taylor Baby Taylor-e is the perfect choice. 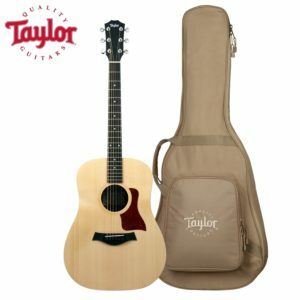 Looking for Taylor quality in a small-sized guitar? The Taylor GS Mini acoustic guitar gives you Taylor construction and sound in a compact package. Modeled after the popular Grand Symphony body style, the GS Mini is a portable guitar that will amaze you with its big sound. 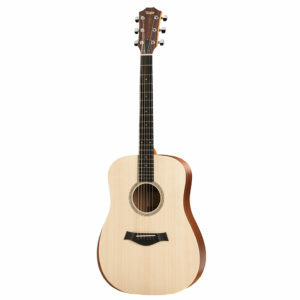 Typically we expect small sounds from small guitars, but thanks to the luthiers at Taylor, the GS Mini bucks that trend. The mahogany top, layered sapele back and sides, and ebony fingerboard give the GS Mini a rich and full sound you will love. 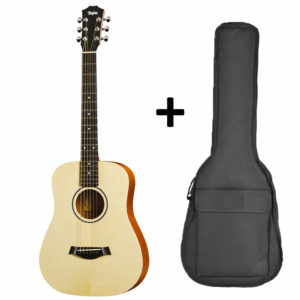 If you are looking for a compact guitar with great sound, the Taylor GS Mini acoustic guitar is for you.